When Will Websites Stop Ripping Each Other Off? 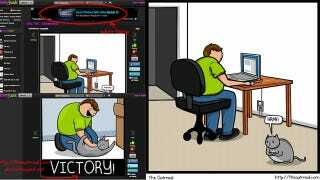 We've used plenty of The Oatmeal's funny comics in the past, here on Giz. But that's always been with artist Matthew Inman's permission, full attribution, and a link back to the site. Some websites aren't so generous. Case in point: Funnyjunk.com. I'm not going to link to them because I don't want to increase their page ranking nor their traffic, but The Oatmeal has published a post drawing attention to their thieving ways. Currently, they're hosting almost 1,000 comics from The Oatmeal on the site (plus thousands more from other artists), without any link or attribution. In fact, they've gone as far as stripping the credit off the bottom of each comic, like you see here. Even worse, Funnyjunk.com's website is actually plastered with advertising, meaning they're actually making money off their devious "work." I know crime pays and all, but it's particularly galling for Inman, who makes a living off his work. This kind of evil treatment is by no means confined to comic creators. Fashion bloggers have a hell of a time protecting their own brands and identities, with UK blogger Amber McNaught battling people who rip off her site's name, pose as her on forums, or even steal her entire blog network's content. Now, she isn't alone in battling the splogs, which exist purely to scrape content from sites that are actually publishing original content. We come across sites that steal our feeds almost daily, but thankfully have a legal team in place to deal with such complaints. It's harder when you're just an individual, and when you don't have the time nor finances to hire a fancy lawyer to whip up a cease and desist letter for you. In The Oatmeal's case, Inman contacted FunnyJunk.com last year with the same complaint, but apparently they passed the thievery off by saying something to the effect of "it was our users who uploaded your photos! We had nothing to do with it! We're innocent!" They took down the comics which had originated from The Oatmeal, but now a year later, almost all of Inman's creations are hosted on there, without any attribution or way of directing viewers to his own site. Unfortunately, this kind of activity will likely always exist online. There's not much that can be done, apart from staying vigilant if you're a content-creator, and contacting the offending site's hosting provider in the hopes they'll take the site down. Sometimes the site will simply change hosting providers, which turns it into a cat-and-mouse game. 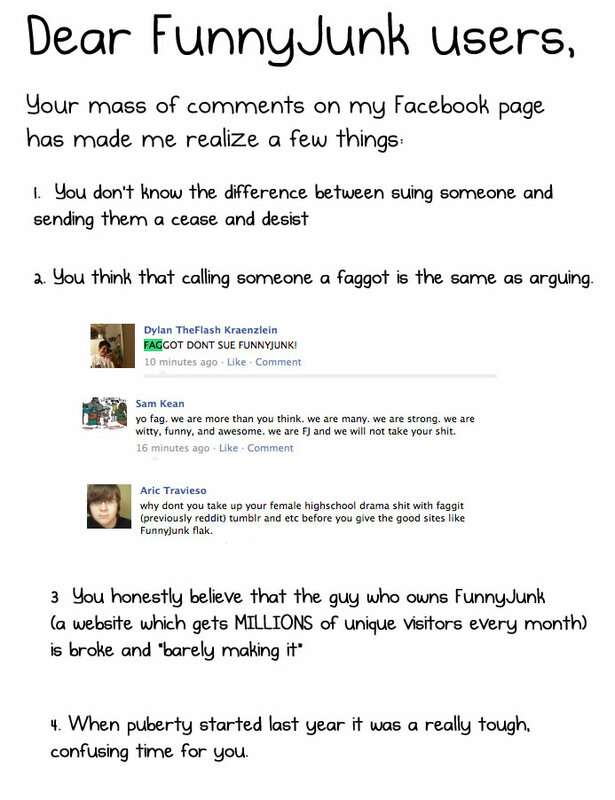 UPDATE: Commenter Odin pointed out that FunnyJunk.com is urging its members to contact The Oatmeal to defend the site, and The Oatmeal has now responded with this following jibe. It's looking as dirty as a weekend trip to Amsterdam, now.